From the Tennessee River to the Gulf of Mexico, Alabama has a tremendous variety of fish species to pursue. 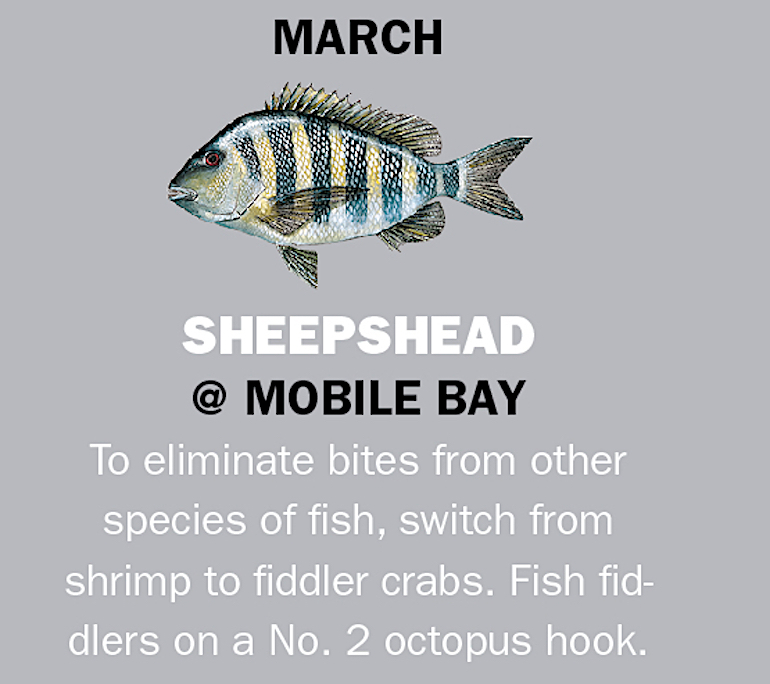 From hand-size bluegill to monster catfish in freshwater or 5-pound sheepshead to 60-pound amberjack in saltwater, this year’s fishing calendar has something for everyone. 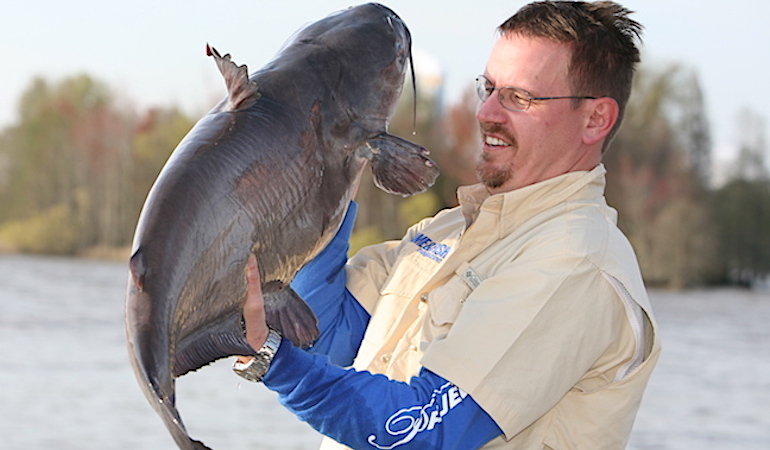 Wheeler Lake frequently produces trophy fish exceeding 50 pounds, with an occasional monster cat over 90 pounds. 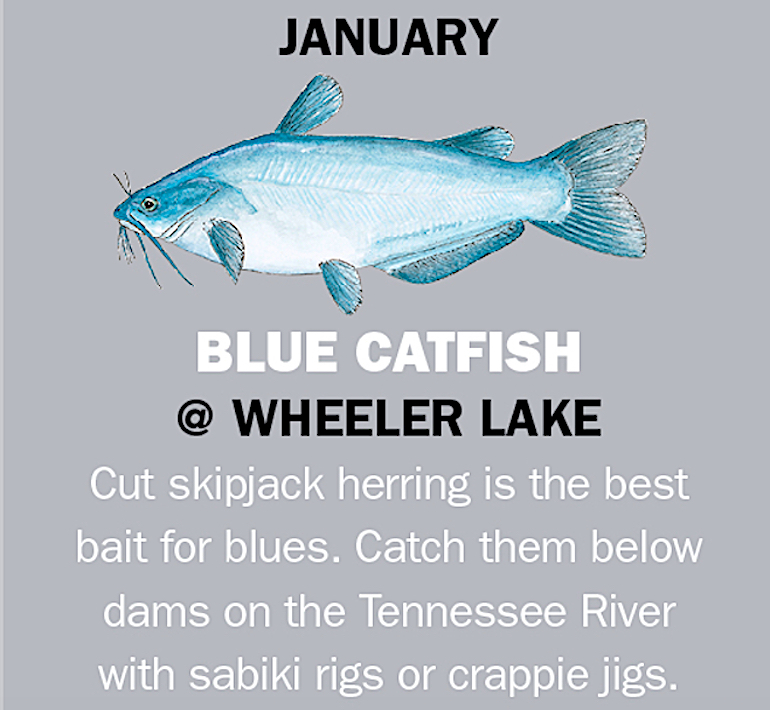 Tournament angler and guide Brian Barton (brianbartonoutdoors@aol.com) says on an average day in January, clients have a 50 percent chance of catching one blue catfish weighing more than 50 pounds. To fish the old canal system, Barton trolls between .2 to .4 miles per hour, dragging skipjack herring on a Santee rig. Slow trolling is effective when the water temperature is above 48 degrees. OTHER OPTIONS: For Mobile Bay largemouths keep in mind that north winds force water from shallow bays to concentrate bass for some great fishing. Pickwick Lake offers winter anglers good smallmouth action along deep channels this month. To catch spotted bass, Rutland says current is essential, as it positions the fish on points and humps. He recommends fishing these structures at depths of 8 to 12 feet. OTHER OPTIONS: For Weiss Lake crappies, trolling jigs along submerged creek channels produces good stringers. In the Gulf of Mexico this is an excellent time to catch vermilion snapper from deep water off Orange Beach. To catch these hard-fighting fish, the guide spools his reels with 20-pound braid, which he ties to a 20-pound fluorocarbon leader with a No. 6 Kahle hook. He completes the rig with split shot and live shrimp. OTHER OPTIONS: At Lake Guntersville during prespawn, anglers who fish a bladed jig near weedbeds will catch 5-pound bass. The Alabama River at Jones Bluff produces flatheads weighing between 7 and 40 pounds this month. Assistant Chief of Fisheries Damon Abernethy recommends Lake Eufaula as a place to hook big bass. Tournament anger Shane Powell of Dothan agrees and says anglers can catch a limit of 5 pounders from beds when the fish are spawning. Sight fishing for bedding bass requires clear water, so Powell targets creeks on the south end of the lake. He says Sandy Branch on the Georgia side holds perfect habitat and clear water to fish for bedding largemouth. OTHER OPTIONS: In April, anglers find Gantt Lake shellcrackers spawning on the lake’s shallow flats. Use Silly Willy swim jigs to target delicious Pompano on Gulf beaches as the fish migrate along shore. Duck River is a 650-acre water supply reservoir located about 10 miles east of Cullman off U.S. 278. There are boat ramps on both sides of the lake; however, outboard motors are restricted to 25 horsepower or less. Anglers may harvest 20 bream per day. To fish, anglers need a valid Alabama fishing license and a free-of-charge annual fishing permit, which is available at the ramps. The long narrow lake has plenty of bank access. OTHER OPTIONS: On Smith Lake a Spook worked over main lake points draws aggressive spotted bass. Look for Lay Lake striped bass to chase spawning shad next to the shoreline in the early morning. Aggressive red snapper are so numerous on our reefs that it’s sometimes difficult to get bait to the bottom when targeting beeliners or grouper. With the short seasons over the past several years, anglers are now landing larger fish. The top three red snapper in the Alabama Deep Sea Fishing Rodeo this July all weighed more than 25 pounds. To find red snapper, use your sonar to search reefs for fish suspended in the water column. Then anchor up current from the fish and deploy a chum bag to entice the snapper closer to the surface. On a good day, red and gray snapper will start working the chum within 15 minutes. An excellent bait in this situation is a 4/0 circle hook concealed in a small piece of a cigar minnow. Select a weight so the bait slowly sinks below the chum. OTHER OPTIONS: Float trips on the Conecuh River above Gantt Lake often produce more than 50 largemouth bass strikes on light tackle. Fly-fishing for Aliceville Lake bluegill with popping bugs near shoreline cover is excellent. Not native to the Choctawhatchee, flatheads have now expanded their range upstream to Newton. Ken Weathers, District IV fisheries supervisor, reports finding flatheads weighing from 2 to 38 pounds while shocking their habitat on a lower stretch of the river. Public boat ramps are available at four locations on the river from Newton to the river junction in Geneva. For maps, visit www.outdooralabama.com. 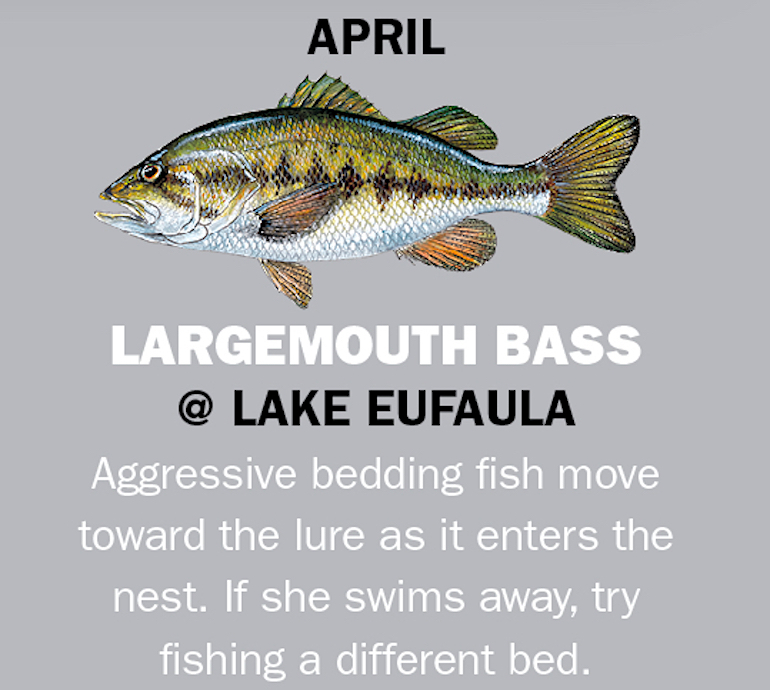 OTHER OPTIONS: For Pickwick Lake largemouths, anglers who find a school of fish on a ledge can hook large numbers of bass. At Orange Beach, king mackerel weighing 30 pounds attack baits trolled from the surface to 20 feet deep. The opening of amberjack season on Aug. 1, gives offshore anglers have an opportunity to tangle with 20-pound AJs, and 40- to 50-pound fish are not unusual. Occasionally, anglers land 60-pounders. AJs offer fast action and don’t hesitate to attack artificial lures or live bait. Since AJs hunt in schools and can be anywhere in the water column, 9-ounce butterfly jigs on 60-pound-test leaders provide for quick hook-ups. Lower the jig to the reef, then lift the rod and reel as fast as possible to recover 20 to 25 feet of line. Pause, lower the rod tip and repeat. Expect to receive a hard strike on the first drop from a 20 pounder. To target big AJs, leave the jigs in the tackle box hook. Instead, hook a lively hard tail (blue runner) on a 7/0 or 9/0 circle hook with an 80-pound-test leader. OTHER OPTIONS: On Lake Neely Henry, night fishing over a submerged light attracts crappie. On the Alabama River, mullet fishing from sandbars is excellent this month between Claiborne Dam and Cliff’s Landing. On a good day, anglers report catching 30 to 40 fish weighing between 1 1/2 to 3 pounds, with a few weighing more than 5 pounds. Anglers have the best success drift fishing while using their trolling motors to control speed. Drifting over the same track where you caught fish earlier is a productive strategy. Good places on the lake to begin fishing are the flats 15 to 20 feet deep in the coves of Wind Creek and New Hope. It is tempting to fish more than one rod by using rod holders, but you will catch more fish by handholding one rod. It allows you to feel the bite while keeping the bait just off the bottom. OTHER OPTIONS: Try the Sipsey Fork for rainbow trout — this heavily stocked area offers year around trout fishing and cool waters for wading. Perfect habitat and low fishing pressure make Millers Ferry a top destination for flathead catfish. Smallmouth bass numbers and size make this a world-class fishery. On a good fall day, tournament angler and guide Cameron Gautney (www.pickwicklakeguides.com) reports anglers can catch 20 to 40 fish, with many weighing more than 4 pounds. On a rare day, the tailrace will produce a trophy 8-pounder. When drifting the tailwaters below Wilson Dam, Gautney makes controlled drifts over rocky bottoms and casts upstream at a 45-degree angle. He fishes the biggest rocks he can find. 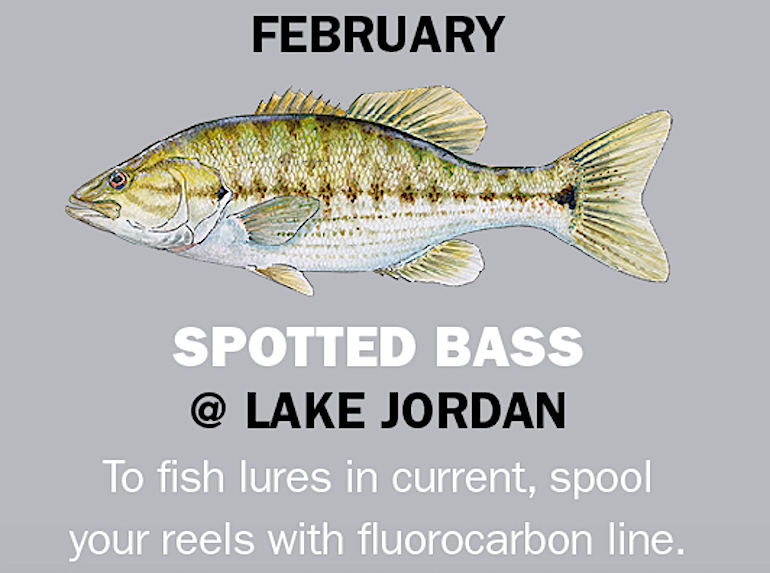 OTHER OPTIONS: For Logan Martin spotted bass, anglers can tempt nice fish with spinner baits, tube lures, and grubs. To catch a limit of Lake Demopolis crappie this month, fish jigs around humps and over ledges. Trammell says you will usually find crappie 8 to 10 feet deep and holding on top of big balls of baitfish. OTHER OPTIONS: Current breaks on structure in the Wheeler Dam tailrace hold big smallmouth now. On Neely Henry Shad Raps fished under and near dock lights on cool nights attract hard-hitting stripes. It is illegal to use herring for bait, so the guide uses gizzard shad. To cover the water column, Vines fishes with eight baits: four on down rods, two behind planner boards, and two below corks drifting behind his boat. OTHER OPTIONS: At Fort Morgan the Dixie Bar off the western tip of the peninsula offers world-class fishing for bull red fish. Big Wilson Lake blue catfish are feeding on flats 15 to 30 feet deep on the upper lake.